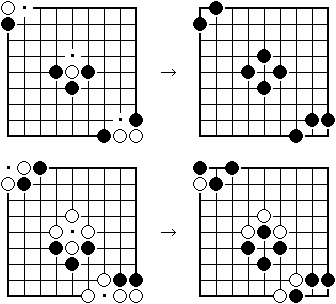 9×9 Go (Igo, Baduk, Weiqi) game. 1. This game is based on the Japanese Go rule. 2. The default handicap (komi) is 6.5: Black gives to White in an even game. 4. An illegal point: foul defeat (9D-18K), warning dialog (19K-30K). 5. The match is stopped by both passes. If the automatic designation of dead stones is wrong, please correct by clicking. If there is a seki, please change enabled territories (■or□) into disabled territories (×or＋) by clicking. 6. Players can rank up by points; 200 (8D-5D), 100 (4D-1D), 70 (1K-9K), 50 (10K-18K), 20 (19K-25K), 10 (26K-30K). 7. Abbreviations used in the game. 8. Please see also the Q&A. This game competes for the number of territories (intersections). 1. You can take opponent's stones by surrounding. 2. You cannot move to the place which becomes same shape repetition. Once it is necessary to move to other places. This state is called "ko". 3. If you cannot take opponent's stones, you cannot move to the place where your stones are taken. 4. Black and White cannot move to "・". Because their stones will be taken. This state is called "seki". 5. Stones which have two eyes are alive and are not taken. 6. After the match stopped, stones which cannot make two eyes are taken as dead stones.